Soak raw rice, rolled oats and split black gram lentil together in sufficient water for at least 2 hours. Grind this in batches along with red chillies and carrots. Add salt to taste and adjust water as required to achieve pouring consistency for the batter.It should not be too thin, should be slightly thicker than buttermilk consistency. This batter does not need fermentation, so you can make dosa with it immediately. Heat a griddle/ tawa/ flat pan, smear a couple of drops of sesame oil on this pan and spread it. Pour a ladleful of this batter in the center of the pan and spread quickly into a circle making it as thin or thick as you prefer. Add a few drops of sesame oil around the crepe/ dosai or on top of it and let it cook until the lower side starts to brown. Remove with a spatula and flip over. Let the other side cook until a few brown spots appear on it and then remove from heat and serve with chutney, sambar or spice powder. Yield depends on quantity of batter used per each crepe/ dosai. dosa has turned out very well, like the color. Will try this soon.. I like the makeover. Still retains the clutter free look. Can't tell it is not the regular rice dosai. I usually make it with steel cut oats and don't add any rice. Usha, i love both, the carrot dosa recipe and the new look of your space! And the dosa sounds healthy and tasty! wow..what a click..can actually smell the aroma of it..nice..
the blog looks brighter :-)i really like this recipe, gonna try out for sure. The Crepes look incredibe...healthy and tasty. I love them too, nice color and healthy too. Love the new look. Love the dosa too. New make-over looks great, Usha. I like the clean look of ur site! Carrot and oats another healthy and delicious tiffin idea! Nice clean look on your blog .Your dosas look great simple and tasty. Your blog has a good makeover.. Like the new look.. Healthy and great dosa.. A must try. nice layout. looks fresh and neat. crepes looks so crisp and perfect. will try it. Hi Usha, thank you for the wishes and same to you too. Its been a while since I dropped by and I didn't know that you got your own domain. Congratulations. 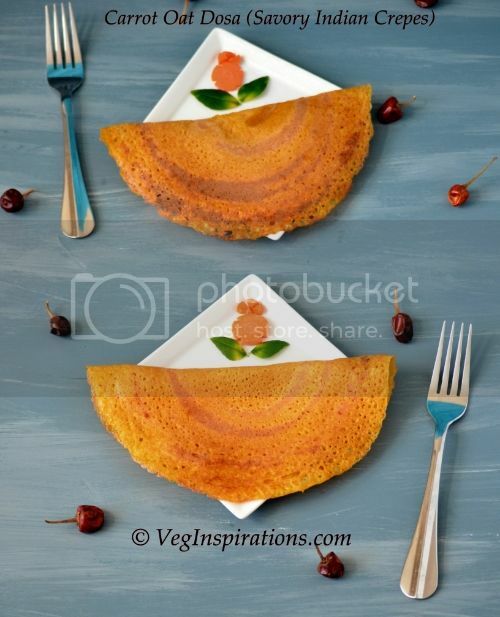 As always you have come up with this unique and healthy dosa recipe. the color looks so crispy! looks like our real dosa..
Lovely, healthy and tasty dosa. The space looks clean and neat. Happy New Year to you and your family, Usha! Adding oats in the dosa batter is such a neat idea! 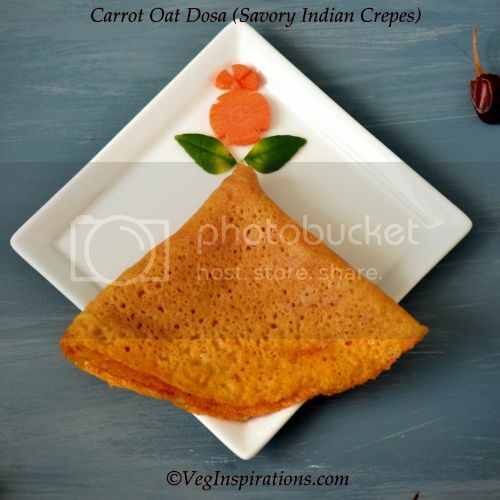 i tried this Dosa yesterday and it came out really well....it was very tasty and its very easy to make it..Hats off to ur Oat Dishes.Iam gonna try all ur oat recipes. Love this dosa.. used to make this for my kid.